Summer is upon us down in the Southern Hemisphere and as the days heat up we will most likely be seeing a whole lot of sun. Wouldn’t it be great if we could harness all that solar energy? Well, fortunately for us there is literally no single technological issue that can’t be solved with a perovskite. This is no ordinary perovskite however. In earlier articles I described perovskites with the formula ABX3, where A is a large cation, B is a smaller cation and X is an anion. The large A-site cation does not necessarily have to be an atom, it could be for example, a large positively charge organic compound. 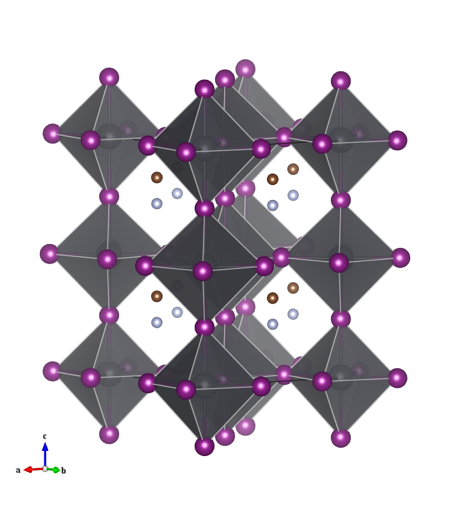 The light harvesting perovskites that have been causing quite a stir in the solar cell industry contain a methyammonium cation on the A-site with lead halide octahedra forming the corner linked network (Figure 1) . Figure 1: Crystal structure of methylammonium lead iodide. These perovskites have attracted quite a bit of attention due to the unprecedented improvements in energy conversion efficiency (that is how efficiently they convert solar energy to electricity) over the past five years. While they started off at 3.8 % in 2009 , the perovskite solar cell efficiency is now 19.3 % . For reference, current commercial crystalline silicon is between 17-23 % efficient . Of course the main concern to the average consumer is cost, and this is where perovskites really begin to shine. 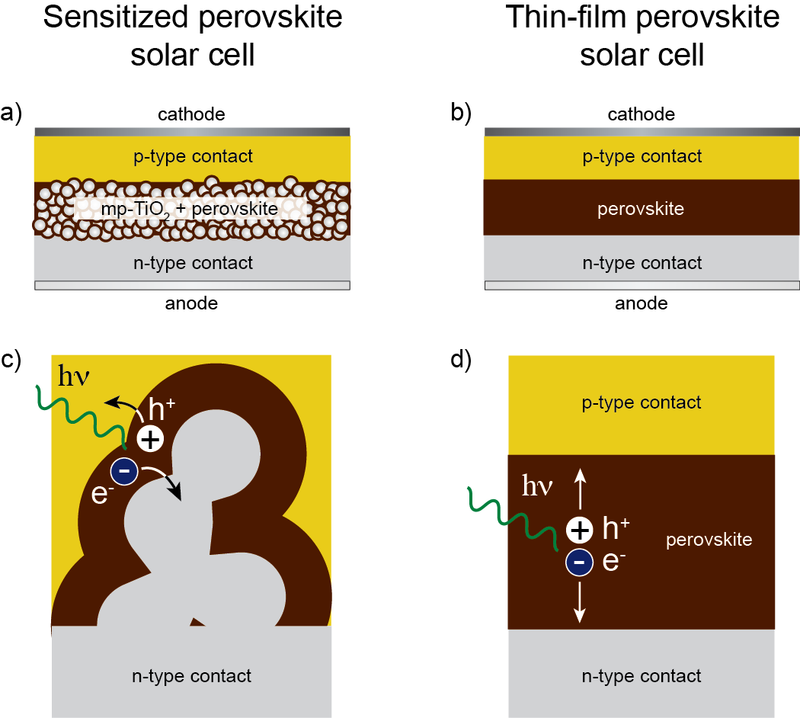 Perovskite solar cells are made from cheap starting material and are easier to manufacture compared to the currently employed crystalline silicon solar cells. The other more recently discovered benefit of the methylammonium perovskites is the role they play in the actual solar cell. In the simplest form of a solar cell, there is a material which acts as the light harvester, absorbing visible light and generating a negative charge (electron) and positive charge (“hole”). These charges are transferred into a material which allows the negative charges to be extracted to an external circuit as electricity (Figure 2). Originally titanium dioxide, which acted as the charge transfer material, was coated with the perovskite as a sensitiser to absorb visible light. It was recently discovered that the methylammonium lead halide perovskite can act as both the light harvester and charge transfer material. This discovery paved the way for perovskites to be used in alternate solar cell architectures, such as thin film solar cells. It isn’t all sunshine and rainbows for perovskites however. The perovskite itself isn’t actually stable under humid conditions as it readily dissolves in water. Further, there have been concerns surrounding the use of toxic lead, although some progress has been made in this area by replacing lead with tin. Also, like any perovskite, the structure is tuneable with different A-site and halide variants possible leading to further improved properties for the tin varieties. The future is bright, the future is perovskite. Service, R. F. Science 2014, 344, 458. McGehee, M. D. Nature 2013, 501, 323.